Tayii Ḥaw̓ił ƛiišin Derek Peters, Olivia Peters, and Executive Councillors Trevor Cootes and John Jack attended the American Indian Film Festival in San Francisco for the screening of waałšiʔaƛin. Filmmakers Amanda Munro and Brandon Thompson hold the mikes (Munro/Thompson photo). If the film’s reception at festival screenings this fall is any indication, the Huu-ay-aht are onto something. Ahead of its public release, expected next spring, Coming Home (waałšiʔaƛin) has been bringing home the honours for B.C.-based filmmaker Munro/Thompson, which has worked on the project with Huu-ay-aht First Nations for the past two years. Last weekend, waałšiʔaƛin won best documentary at Chilliwack Independent Film Festival. At Seattle’s Social Justice Film Festival last month, competing against documentaries on prominent issues across North America, waałšiʔaƛin earned a director’s choice nod. At the 43rd annual American Indian Film Festival in early November, it was nominated for best short documentary. There have been four other awards with more festival screenings ahead. This is neither the first documentary commissioned by the Huu-ay-aht nor the first to attract recognition. Heart of the People is an award-winning 1997 film about the impact of logging. Return of the River, a 2003 film, looks at efforts to restore the Sarita River watershed from the effects of logging and overfishing. Ancient Spirit, Modern Mind (2017), was a five-minute short, a prelude to the new documentary. In essence, the new film documents Huu-ay-aht in the aftermath of treaty signing in 2011, focusing on the desire to welcome home community members who have left over the years. As with several other west coast First Nations, the Huu-ay-aht have withstood destructive forces of natural disasters, colonization, disease, residential schools, depopulation and resource extraction. Coming Home represents inspiration and a vision for the future, showing efforts, not only to recover from colonization, but to build a future for Huu-ay-aht people beyond what has existed in the past. The story is one of overcoming adversity, told from the viewpoint of several generations. They speak of healing and rebuilding their homelands, reclaiming cultural connections and bringing their people home. “One of our priorities as a nation is that by 2033 we would like to see half our people come home,” said Chief Counsellor Robert Dennis Sr. Depending on the season, between 90 and 120 residents remain where thousands once lived. With almost 750 members in the First Nation, the executive council hopes to see more return in the next 15 years out of the total living outside of Huu-ay-aht communities. Dennis cited the example of Andrea Lucas, a Huu-ay-aht woman who, despite reluctance, returned home to work on the Sarita River project. The film appeals directly to a sense of identity and belonging. “I think it tugs at the heart strings, but we will have to do more,” Dennis said, acknowledging that the world beyond Huu-ay-aht has its allure, their greatest obstacle to bringing people back. “But we’re confident,” he added, noting that a subdivision plan is almost complete. The housing factor is but one piece of a complex puzzle that has to come together around employment and natural resource development, in effect reversing the forces of colonization. Their long-term goal is self-sufficiency. “One of the things we have found is that it is good practice to do things that make the community aware of their homeland and what’s happening,” Dennis said, explaining their use of documentary film. Director Brandon Thompson and partner/producer Amanda Munro first met with the First Nation in 2012, a year after the Maa-nulth Treaty was signed, marking a new chapter in Huu-ay-aht history. What started as a conversation around the proposed LNG development, a story about community engagement around a divisive issue, later took a different course. Filming began in 2016. Various aspects of community potential, including efforts to rejuvenate the salmon, come into play in the course of the film. The project took two years to complete, but it can take time to tease apart the meaning to a story. “It’s a process of being in a community, taking the time to build rapport, to build trust,” Thompson said. Several more festivals are scheduled to follow into the spring, after which the Huu-ay-aht and the filmmakers plan to present local screenings in Bamfield and Port Alberni. Huu-ay-aht delegations have been accompanying waałšiʔaƛin as it tours. 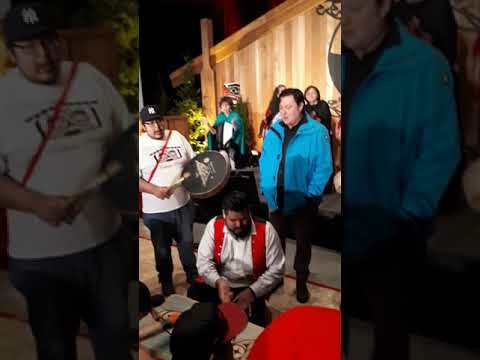 In Chilliwack, they performed, Wii-a-la, a traditional song with connections to Indigenous peoples along the California coast.